We know that coloring your films can be a time consuming and frustrating process, but we also know how much better a well-graded video can be. Using Adobe Premiere Pro LUTs can not only give consistency between your shots; it can help the narrative of your movie by reflecting the tone and emotion in a scene. In this tutorial, we will explain what LUTs are, what they do, and how to use them in Premiere Pro CC. Let’s jump right into this step-by-step guide! When to Use a LUT? A LUT (look up table) is a preset you can use to adjust the colors of your clips, based on a mathematical formula. Don’t worry! You don’t need to be a mathematical genius to become a master. Premiere interprets the formula to apply the color grade to your clips. Every pixel in a single clip will have a number attached to it, representing its color. The LUT is a conversion table that instructs Premiere on what the new color value of each pixel will be. Color grading your clips becomes much easier using these presets. Premiere has several built-in LUTs, including those you might need to change the color space to another camera type. Select your clip in the sequence. In the Creative section, find the Look dropdown in Lumetri Color. Select a look from the drop down. You can also scroll through the LUT window below the dropdown to preview each preset. When video editing, you can create your own LUT using any of the color grading tools within Premiere Pro. Add corrections and grading to a single clip until you are happy with how it looks. With the clip selected, right-click on the title of the Lumetri Color Panel and choose Export .cube. Save the LUT to a location of your choosing. Once you have created your LUT, you will need to import it. You can also import ones from other websites or the Motion Array marketplace. Check out these free LUT packs you can download today! We recommend saving a LUT folder for easy access in the future. In the Look dropdown, select Custom. Locate and select your saved LUT. Click Import, and you’ll see it appear in the Look list. You can now add this import to any clip in any project. You can even send your LUT file to other members of your team for use within After Effects and Photoshop. Different cameras use different methods and settings for collecting color data in a shot. Some cameras will result in grey, almost misty looking footage, while others may look undersaturated. LUTs can be used to convert the color space captured by the camera to a color space of your choosing. Using a LUT is not a quick fix that will make all of your footage look the same. It won’t color correct your footage for you. Instead, LUTs can save you a great deal of time when grading your film. You can create specific ‘looks’ that can be applied en masse to the clips in your sequence. While you will still need to finely tune each clip using the Premiere Color tools to ensure consistency between shots, a LUT can be an efficient way to test a variety of different grades. Not only can you create your own LUTs from within Adobe Premiere, but they can also be designed and used in Photoshop and After Effects. This gives you the opportunity to collaborate with designers and animators too. Right, now things are going to get a little technical here. Let’s start by saying that for best results, you will want to use a 3D LUT or .cube file. If you are not interested in why then feel free to skip this section. Still with us? Brilliant! We already know what a LUT is a conversion table used by Premiere to determine the changes in color value to each pixel. 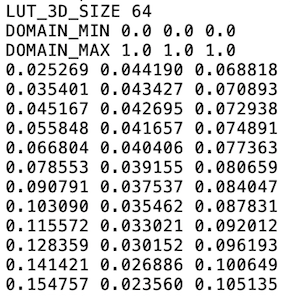 The main difference between 1D and 3D LUTs is how many different color values the conversion table contains. A 1D LUT will contain three output values: red, green, and blue (RBG). When you use a 1D LUT, you can affect the color and contrast of a clip. A 3D LUT contains far more data than a 1D LUT and will look at the entire color space including Luminescence and Saturation. It’s important to remember that using a LUT won’t fix poorly shot footage, and you shouldn’t rely on them for all of your color grading needs. They can, however, help speed up the grading process, and allow you to try more creative and ambitious things. Motion Array has a vast selection of LUTs available for download, which can help you build a library of color presets in some incredible styles. Using Adobe Premiere LUTs is easy, as with most editing what you can achieve will be down to your creativity. So, now you know all about using them effectively, you can get cracking setting some up, or why not check out another tutorial!